When embryos grow for a longer time in the laboratory and undergo critical developmental changes before being inserted in the womb. This procedure is known as blastocyst. This kind of technique helps experts to determine the most competent embryo(s) for transfer to the womb and can help identify which embryos have the best growth potential. This kind of culture increases the chances of achieving a viable pregnancy. The embryo undergoes several cell divisions and by the time it is achieved its first cell differentiation, into two distinct cell types, by the time it reaches the blastocyst stage. It does not improve the quality of the embryos or any kind of guarantee even though it has gone through this process. However we do have impressive success rates for this treatment. A woman who have a large number of embryos can benefit, this is because not all the embryos are considered to have the ability to form a blastocyst, and as many embryos progressing each day may decrease. 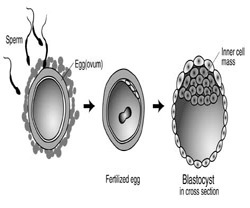 With this procedure blastocyst culture allows the most advanced and competent embryos to be selected for the transfer on the fifth day following an egg collection. The results indicate that with five or more embryos from day one after egg collection, it is considered to be an increased pregnancy rate using extended culture compared to using day two or three transfers. At the clinic the treatment cycle is exactly the same as that of IVF, except that your embryos will be cultured for a longer in the laboratory, which that the day the embryo is transferred will be five days after egg collection. This kind of process enhances our embryologist’s ability to select the embryo’s which can result in pregnancy.